The growing pile of student-loan debt has become a significant burden for millions of Americans, particularly younger people. 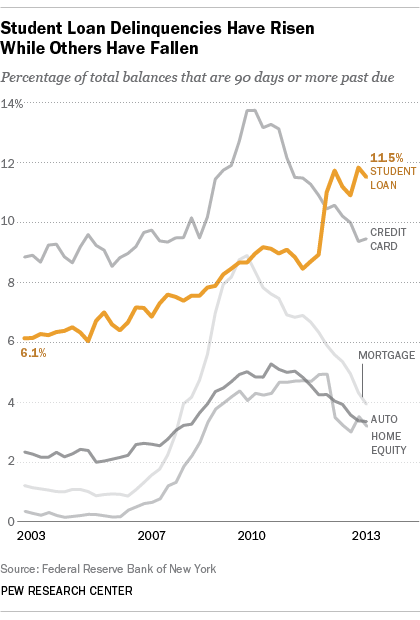 Not only is the overhang of student debt impeding wealth accumulation among younger adults, as a new Pew Research Center report concludes, but more and more Americans are having trouble paying down their student loans on time. In 2012, according to analysis by the Federal Reserve Bank of New York, more than 30% of student-loan borrowers who moved into their repayment cycles were delinquent (that is, they’re 90 days or more behind in their payments), up from 20% just eight years earlier. That “effective delinquency rate,” which excludes people who aren’t yet on the hook to start repaying their loans, has risen among all age groups but is highest among borrowers younger than 30: 35% of that subgroup was delinquent in 2012. The New York Fed estimates that in 2012 a total of 39 million people owed a total of $966 billion in student-loan debt, for an average balance of nearly $25,000. 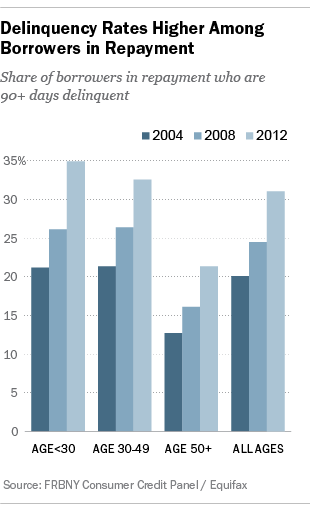 (In 2004, by contrast, 23 million borrowers owed an average of $15,000 apiece.) But the averages obscure considerable variation: Nearly 40% of borrowers in 2012 owed less than $10,000, and almost 30% owed between $10,000 and $25,000. Not quite 18% owed between $25,000 and $50,000, while the remaining 13% or so owed more than $50,000 (including roughly 230,000 borrowers, or 0.6%, who owed more than $200,000). As of the end of 2012, only 39% of borrowers were making any progress in reducing their outstanding balances, the Fed economists found. (Comparable figures for previous years weren’t publicly available.) The rest were either delinquent, still in school and thus not yet obligated to make payments, or in a deferral or forbearance program. The New York Fed’s economists base these estimates on their analysis of a unique dataset of millions of consumer-credit reports, updated quarterly, but their analysis stops at the end of 2012. More recent data from the same source, though only publicly available in the aggregate, shows that the total balance of student-loan debt reached $1.08 trillion at the end of 2013, up 11.8% (in nominal dollars) from a year earlier.